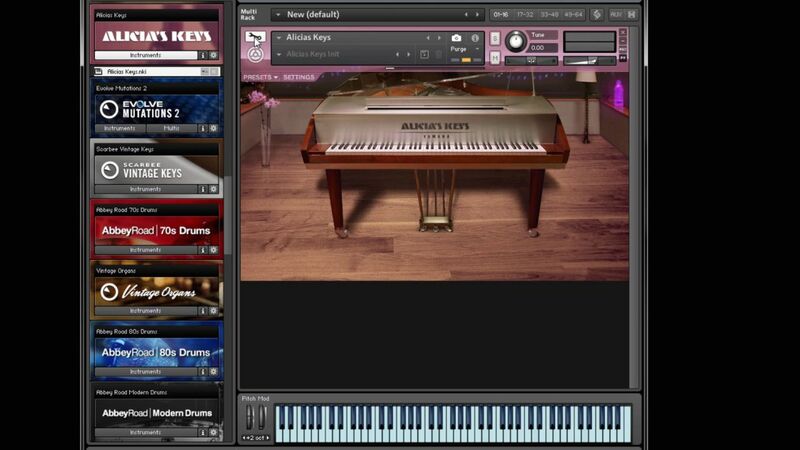 Kontakt offers the ability to play chords within a given key and scale with just one finger. 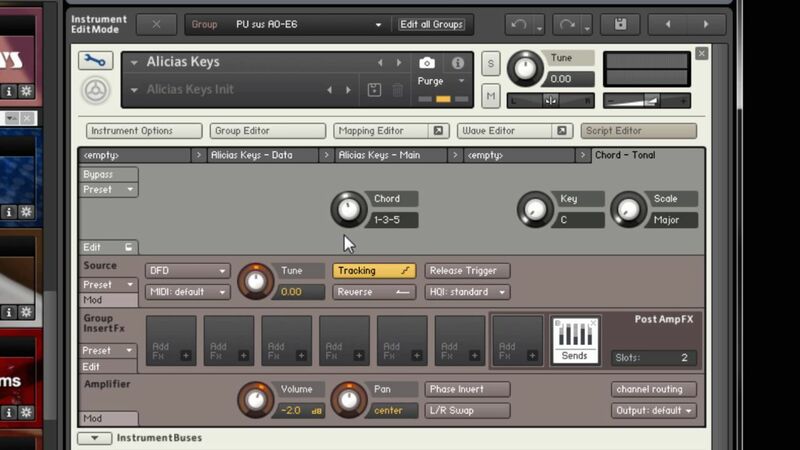 This feature can be a great songwriting tool, and with a little thinking outside the box, it can be used to supercharge an arpeggiator. You’re not a great keyboard player. Have gaps in your knowledge about chord creation. 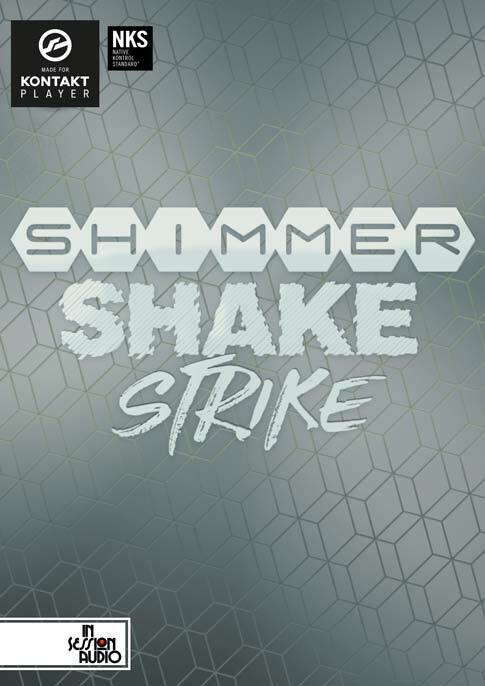 You want to quickly try or sketch out chord changes for a song. You want to try out some unfamiliar scale types. This is how to set it up. 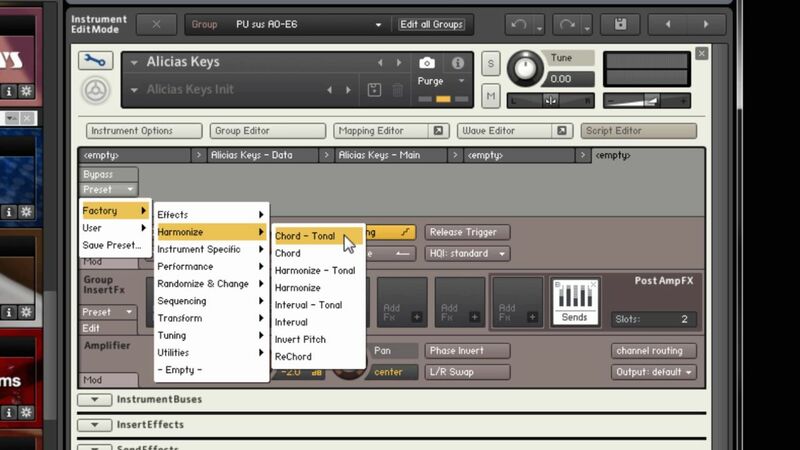 In this first example we will load up load the a sampled piano, Alicia’s Keys – but you can use any piano (or another instrument altogether). 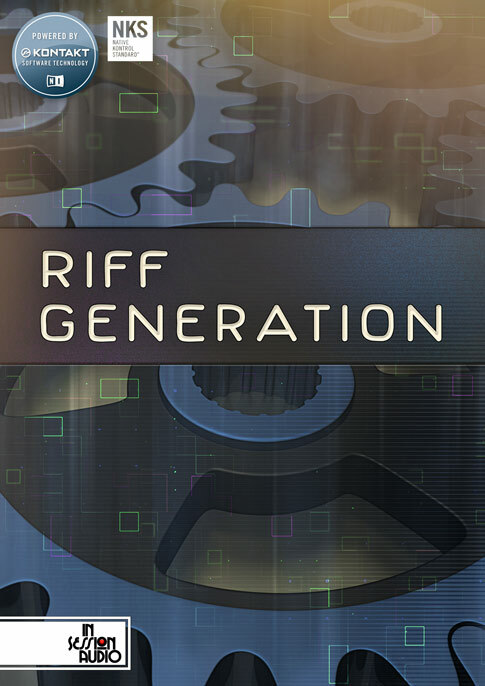 Go into Kontakt’s Edit mode by pressing the wrench icon. Next, press the “Script Editor” button. This will expose five tabs, the 2nd and 3rd of which are already occupied by the instrument’s own scripts. 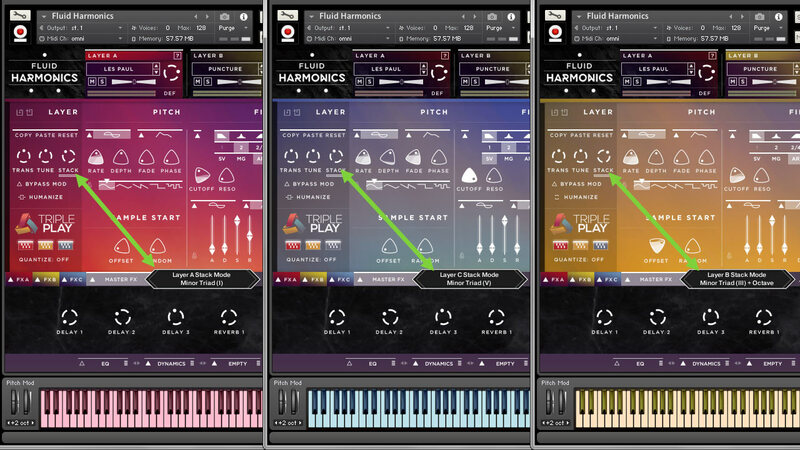 Click on any tab marked “empty”, click the “Presets” menu and select “Factory”, “Harmonize” and then “Chord – Tonal”. By default the script loads a Chord preset with 1-3-5 intervals in the key of C, based on a Major scale. If you press any non-C major notes (which would be the black keys in this example), this script will round it to the nearest correct notes, making sure you never play any notes outside the scale. So now you can quickly sketch out a chord progression. 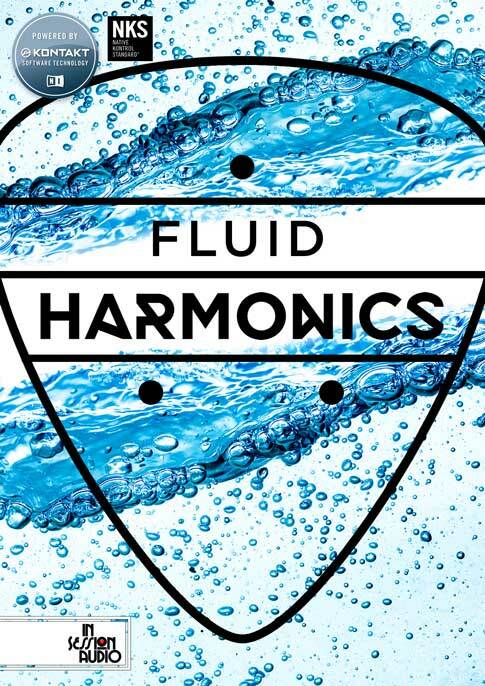 Let’s switch over to our Fluid Harmonics library and apply the same strategy, but use it in conjunction with the three arpeggiators. Use the “Stack” control to make each single note a chord. What’s cool here is that we have a wide variety of chord types, as well as inversions, which makes it even easier to create a harmonically diverse sound. 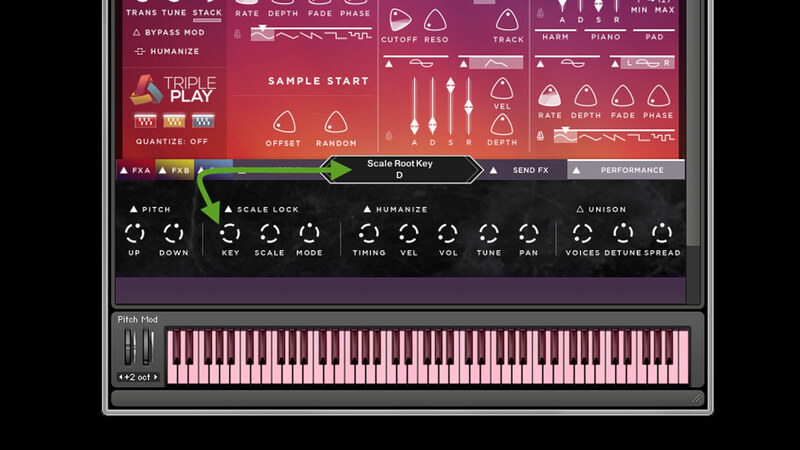 Here’s where you can set the Key (D) the Scale (minor) and the Mode. 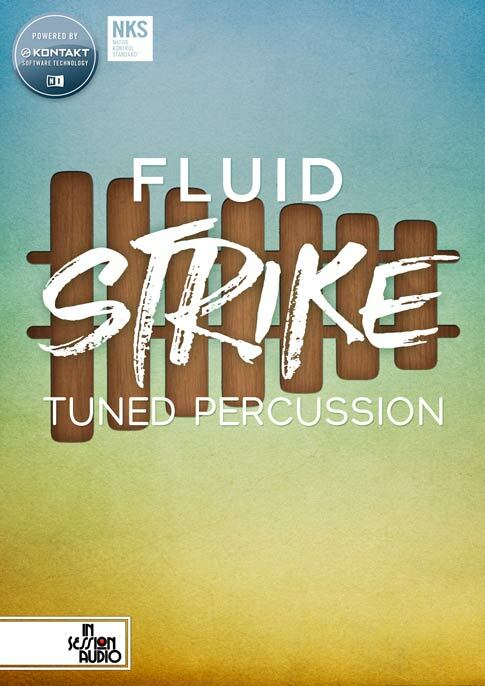 The Mode parameter controls whether out-of-scale notes are rounded up or down.